Many serve each week at our church in ways both large and small to make our worship both beautiful and welcoming. If you would like to join in any area of service please let us know. To see who is serving, check out schedule each month in the servants tab. Our Eucharistic Ministers assist at the altar during the service. They help to prepare and serve the bread and the wine to the congregation. Perhaps you feel God is calling you to this service. Our young people are encouraged to assist our Eucharistic Ministers as Acolytes. The public reading of scripture is something you will hear each Sunday in the church. This tradition dates back to the time of Jesus. Members of the Congregation come forward each week just as our Lord once did to read the appointed lessons. If you have a clear strong voice consider joining our team of lectors in reading God's word. Each week during worship we pray for our own needs and the needs of others. The appointed intercessor for the day leads us in those prayers. Consider joining this ministry if you have the gift of prayer. People leave prayer requests on our web site please check the ministries tab under prayer and add these requests to your daily prayers. Our usher is the first to greet our worshippers as they arrive at the church each week. They help visitors to feel at home in God's house. They are the first in the church to show our hospitality. If you have the gift of welcoming others think about joining our ushers. The Altar Guild prepares the church for worship each week in loving service to God. The Altar Guild also prepares the church for weddings and memorial services. If you would like to know more about the service of the altar guild or would like to donate flowers to be placed in the church please speak to our priest. Each week following the Sunday Service we gather for fellowship in the Parish Hall, or on the patio where we are hosted by a member of our faith community. This gathering provides a relaxed welcoming place where strangers quickly become friends. If you would like to host a coffee hour the sign up sheet is in the Parish Hall. Planning an event, know of some church news, celebrating a special occation? 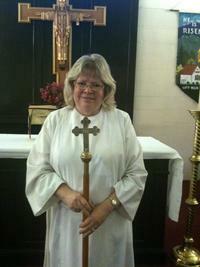 Contact Deacon Peggy Thompson and let her share it on the church web page.